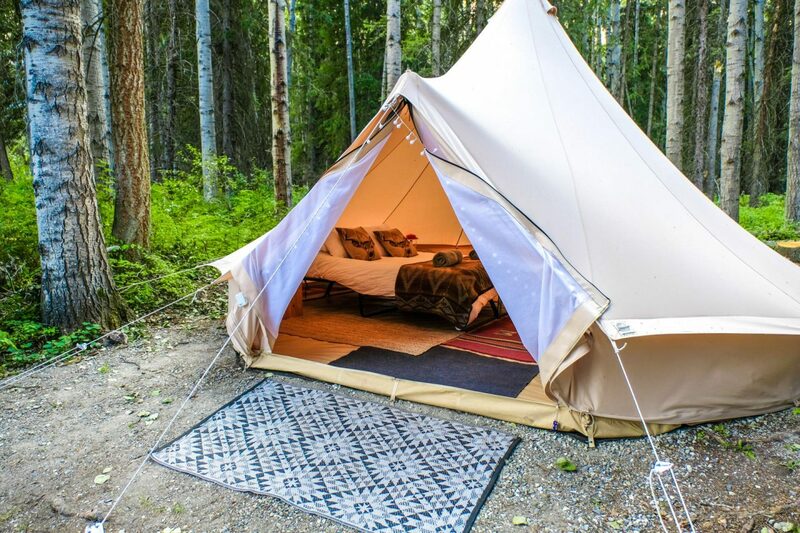 Glamping, aka glamorous camping, is the latest camping trend that is all about reimagining the idea of sleeping outdoors by highlighting the aspects of style and comfort. A warm bed. A hot shower. 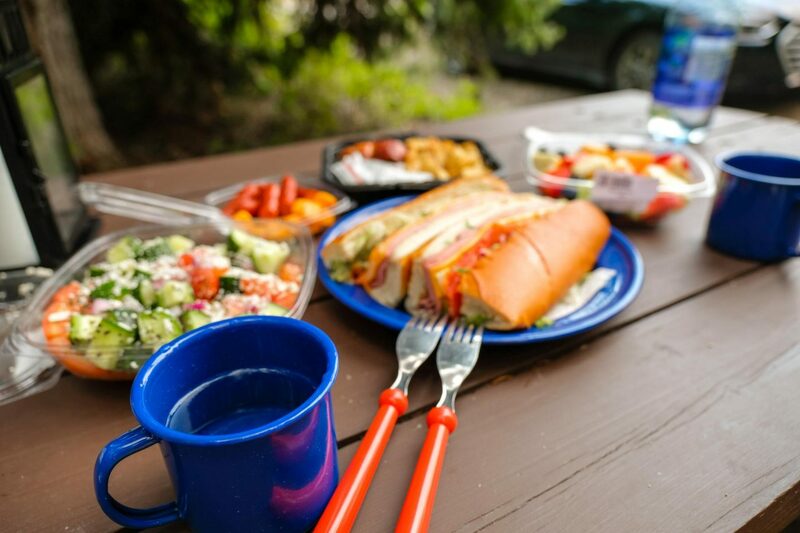 It really is a luxurious camping adventure like none other. 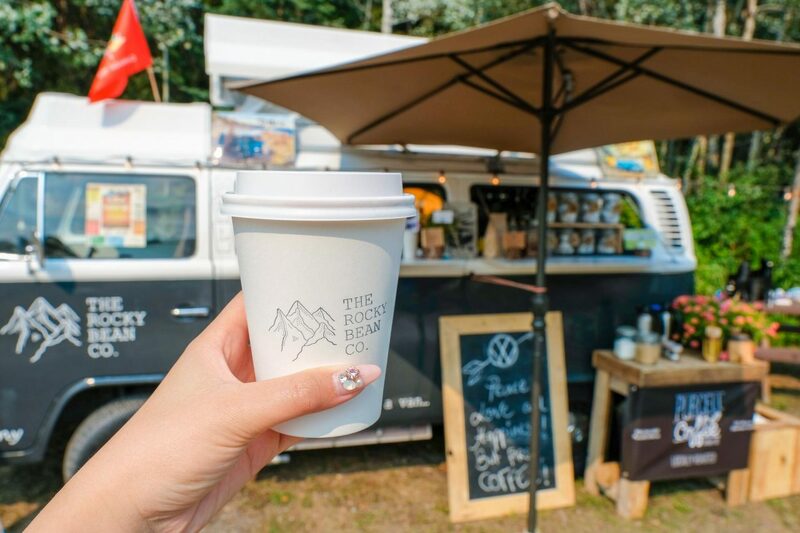 Over the BC Day long weekend here in Canada, I had the opportunity to go on my first ever glamping getaway thanks to Glamping Hub and I am beyond excited to share my trip with y’all! By the way, yes, this is a sponsored post, but all opinions are of my own. Glamping Hub is a third-party online booking platform that provides unique outdoor accommodation rentals all over the world by connecting hosts with travellers. 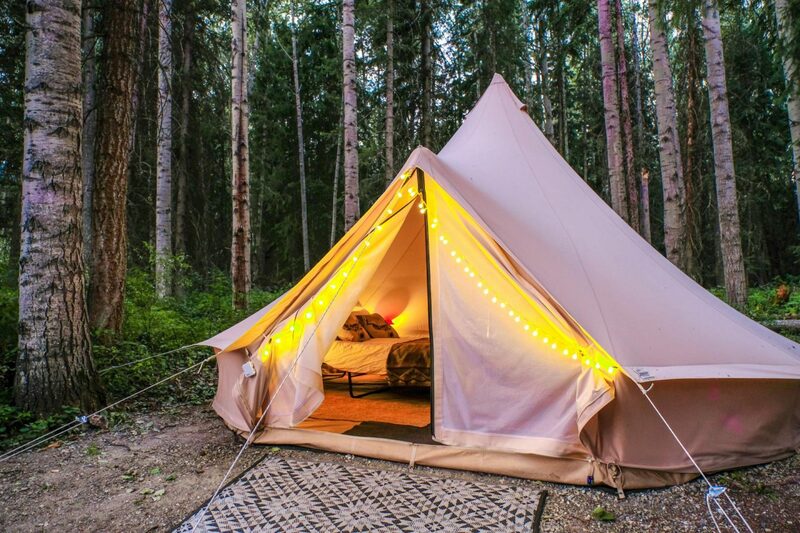 (Think Airbnb but with glamping.) From safari tents to camper vans and even tree houses and cabins, there are a wide range of rental options to choose from for that perfect getaway. All the accommodations are pet-friendly as well so furry friends are definitely welcomed. As mentioned above, this is a sponsored post hence my stay was completely arranged by the Glamping Hub team. That said, their reservation process is still fairly straight forward. 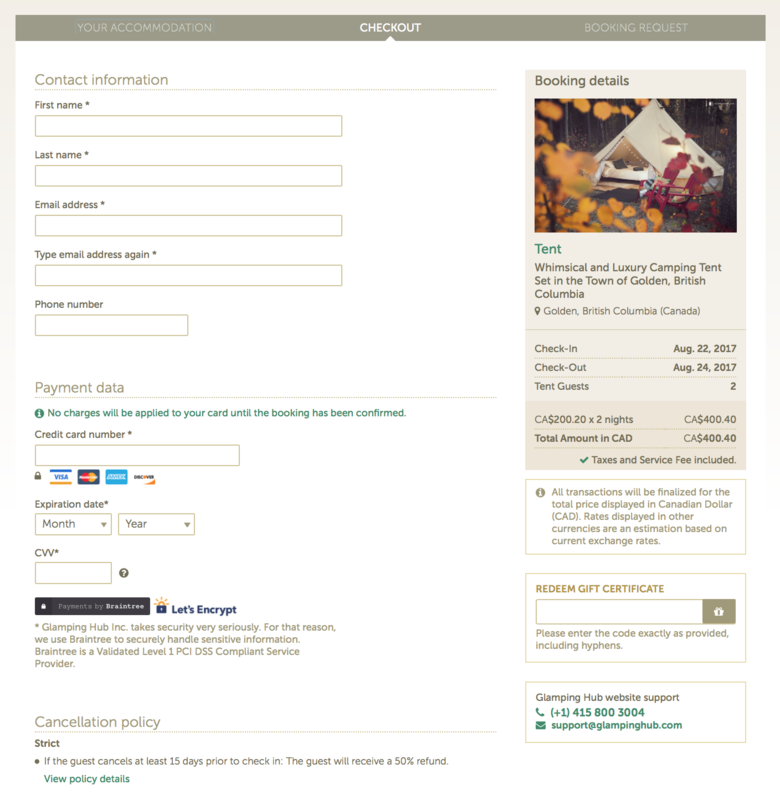 If a glamp is available on the date(s) you wish to visit, simply hit the “Request Booking” button, fill out your information, and proceed with the on-screen directions. Once your request has been submitted, the host will take about 24-48 hours to respond. When the host has accepted your request and your credit card has been charged, you will then receive a booking confirmation e-mail with the details of your stay including the exact address of the glamp. Again, very similar to Airbnb and it really is a no brainer. 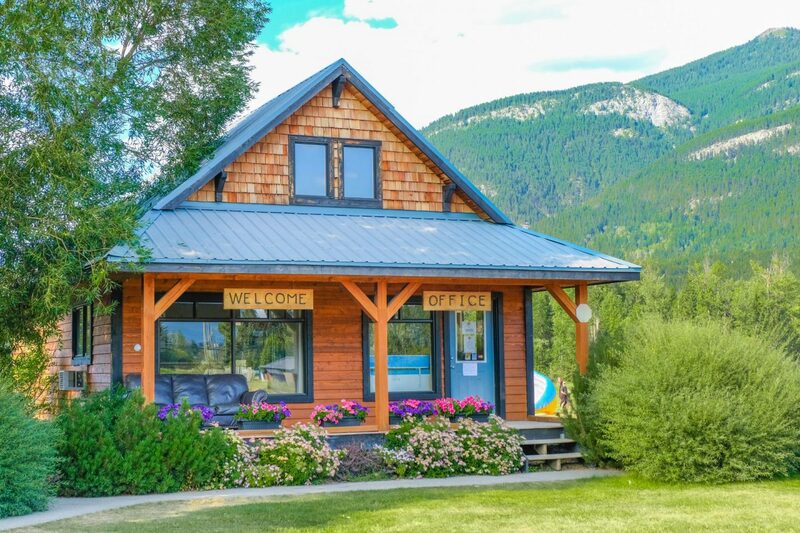 Through Glamping Hub, I was able to discover Love & Lantern, which is located at Golden Eco-Adventure Ranch in Golden, BC just along the beautiful Rocky Mountain horizon. 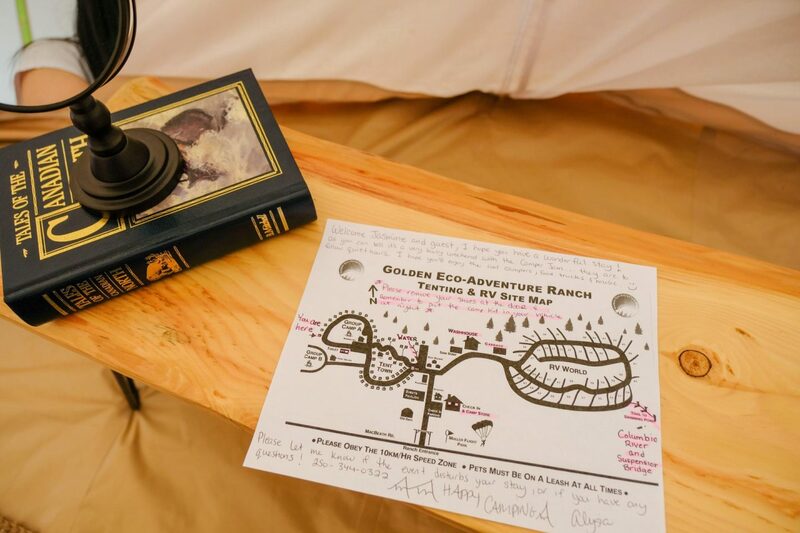 Golden Eco-Adventure Ranch is essentially an RV and tent campground with bathroom + shower and laundry facilities. The campground is divided into numbered sections and each tent space has its own number. We parked our rental car right in front of the tent so in a way it’s kinda like a regular house with driveway parking and an address plaque except you’re in the woods. Definitely very cute! 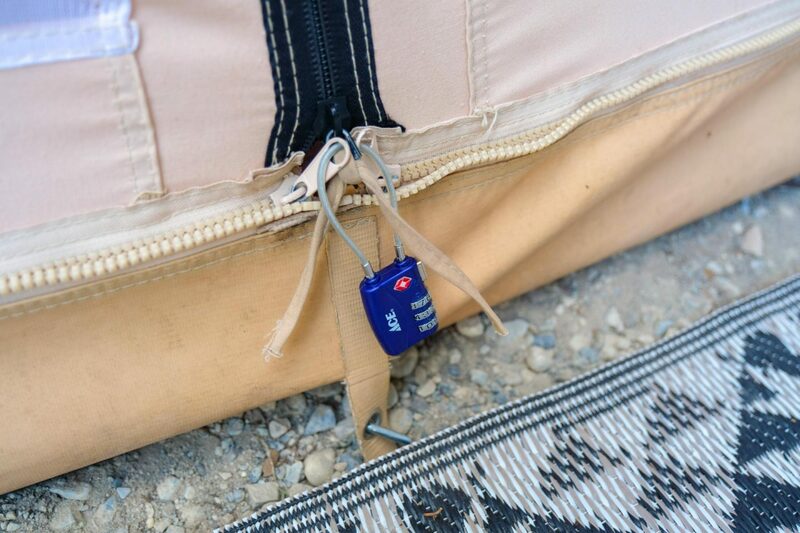 I brought a +1 with me on the trip and prior to our arrival, the host (Alysia) had already set up everything for us and we were given a passcode to access the tent. We literally only had to pack our bags and drive our bums there. As simple as that. Okay, first off, how adorable is this!!!!!!!!!! And can we pleaseeeee talk about the fact that it’s located in a town called Golden!? All ’bout that glam life yo! The tent can be lit up for the night as well. Since there have been numerous wildfires here in BC, open flames have been banned. Alysia does provide cookware and utensils but because we couldn’t exactly cook, we brought our own food from a nearby grocery store. During our stay here, we also got to experience Camper Jam. Not sure if it’s an annual event but it’s a cool little gathering for all VW buses. There are games, live music, craft beer, and food trucks. Oh! And morning coffee!! 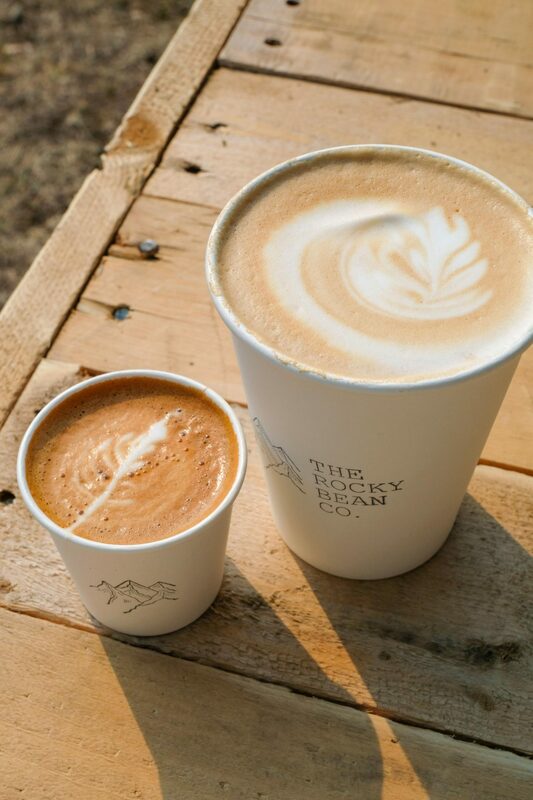 One particular van that really caught my eye was The Rocky Bean Co run by a duo who do coffee out of a van in the Bow Valley. Being able to wake up in the middle of the woods to the smell of coffee? You can’t beat that. 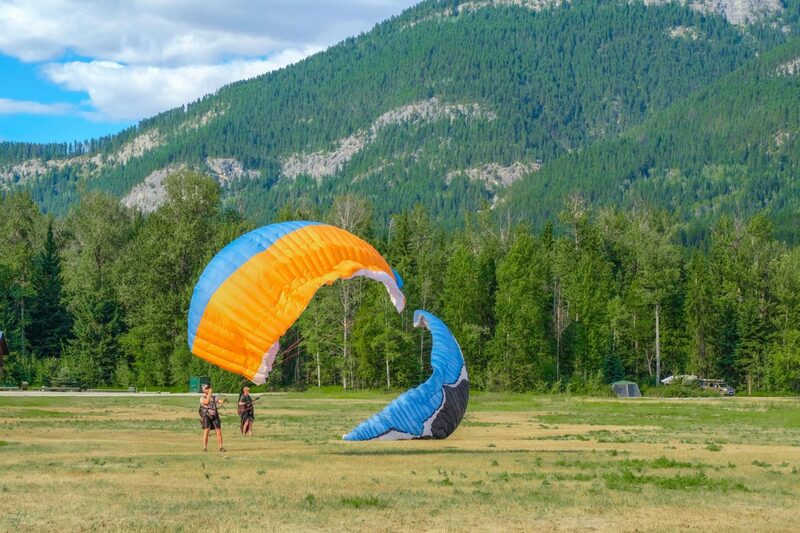 Apart from these fun little activities, campers can also come here to paraglide. 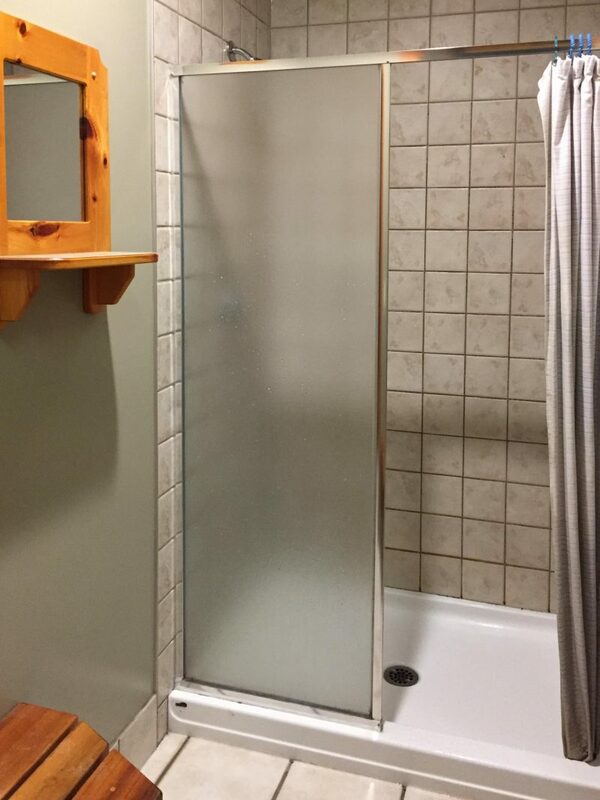 Last but not least, a big highlight of glamping… shower! 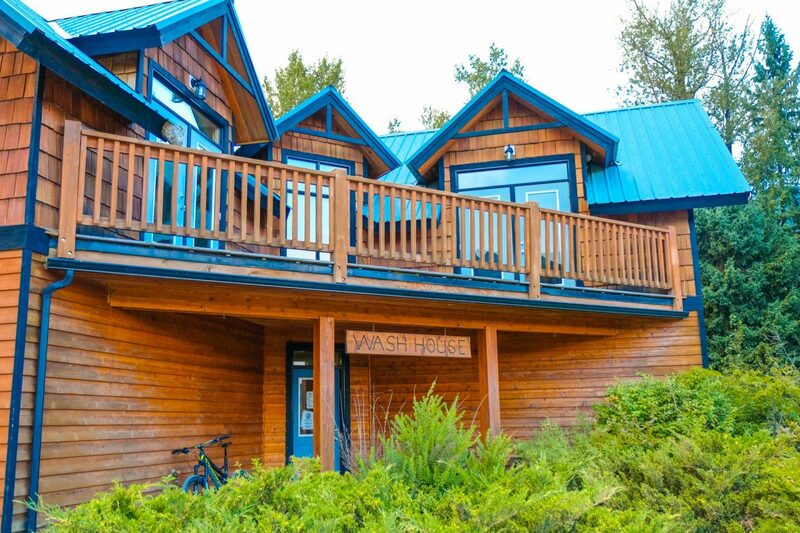 – Extremely hospitable host and welcoming staff at the ranch as well. Alysia was quick to respond my questions via e-mail and also made some awesome itinerary suggestions for us. – Camper Jam = more people = louder night parties. They kept me up until 2am but after things quieted down I really did sleep like a baby. Again, it most likely only occurs once a year so a visit at another time may be much more tranquil. – Lots of mosquitoes but that’s the same no matter where you camp. 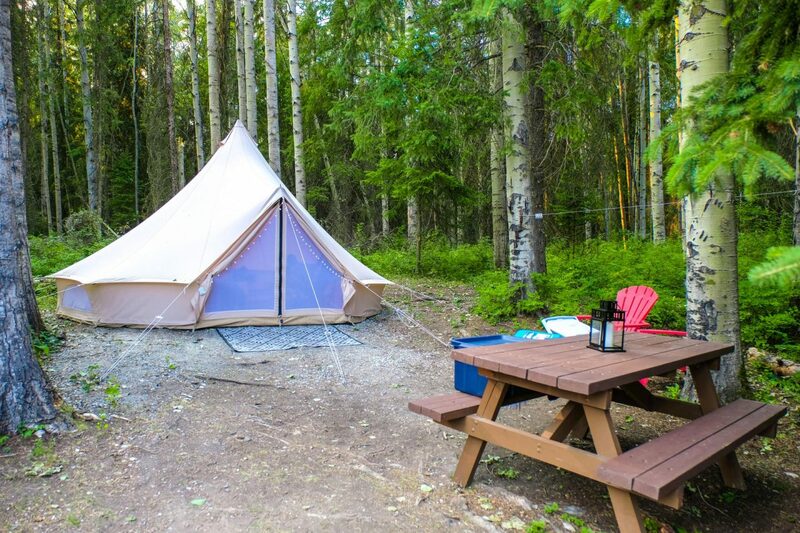 *In terms of price, I rated it as 3 stars because for $195, you really could stay at a hotel and not actually get bit by mosquitoes or have to fight for the washroom with other campers. BUT I can tell Alysia put a lot of time and effort into decorating the tent not to mention this really is a unique experience. 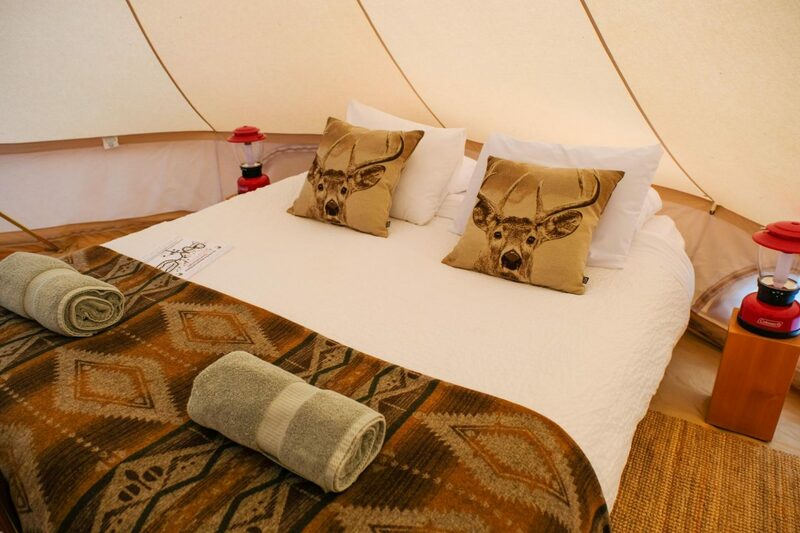 Plus it is glamping after all, a glamorous version of your usual camping fun. I say it’s worth checking out! I will conclude this week’s blog post here and hope this will inspire you to get out there and embrace nature. I also visited Banff on this same trip so please stay tuned for an upcoming photo diary. Also don’t forget to subscribe for newsletters in the sidebar on the right and I’ll see you next week! Please note that I was welcomed by Glamping Hub as a guest. However, all opinions are my own and I genuinely enjoyed my time here and recommend staying with them. Awesome photos Jasmine, it looks like an amazing place to stay! I love the whole glamping vibe, its so photo perfect. I stayed in a teepee in Cambodia, though I did have a bug problem as well. Oh and I need those deer cushions, they are so cute! Thanks so much Tasha! Camping in a teepee in Cambodia sounds like a load of fun too. And ikr!??!?!! Aren’t those deer cushions the cutest!? I almost wanted to ask where the host got them from so I can get them myself too bahahaa. I never heard of Glamping!! What an experience!! Your photos are dreamy amazing!. The place looks so cosy inside, you would never expect that it’s actually a tent! Good to have an assessment of the pros and cons of glamping, and your points are very fairly made, too. It looks like a lovely set up, and I like the decor. 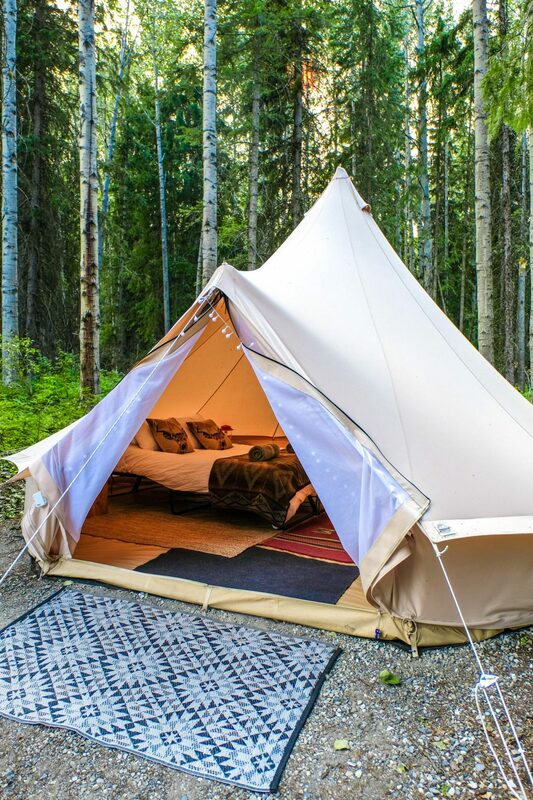 There is tipi glamping near us, and I have always wondered if I would enjoy it. Definitely more tempted to give it a try after your account. Great post with beautiful photos. I love the pros and cons list. I love this post! 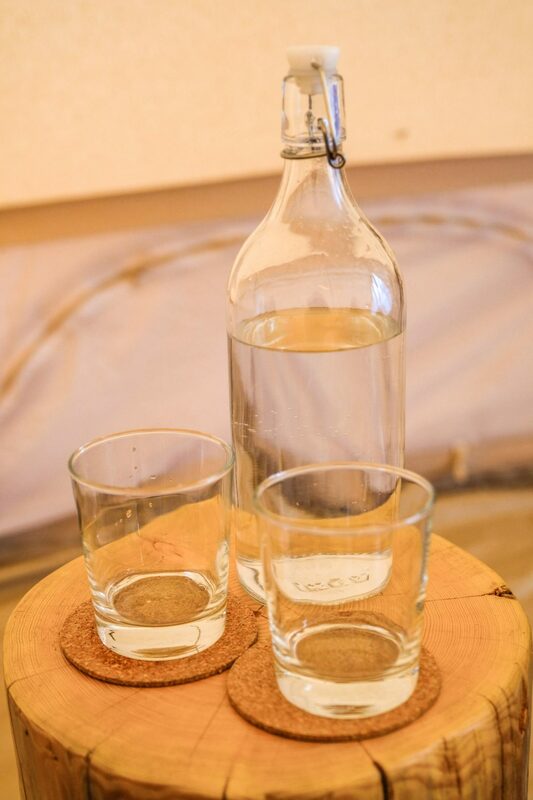 I’ve been wanting to try glamping so much so I appreciate your detailed and honest review! Noise was my concern woh glamping so thanks for providing that info! In terms of noise, like I said, I think it was only because we came during that specific event. Otherwise I don’t see how noise could be a problem when you’re literally in the middle of no where XDD Hope you’ll get to try it soon!! Totally wanting to try glamping sometime! Love all the details of the decor of your spot! Thanks for the pros and cons, you’re right, it costs the same as a hotel but then it’s a totally different experience! Yes there are!!!!!! 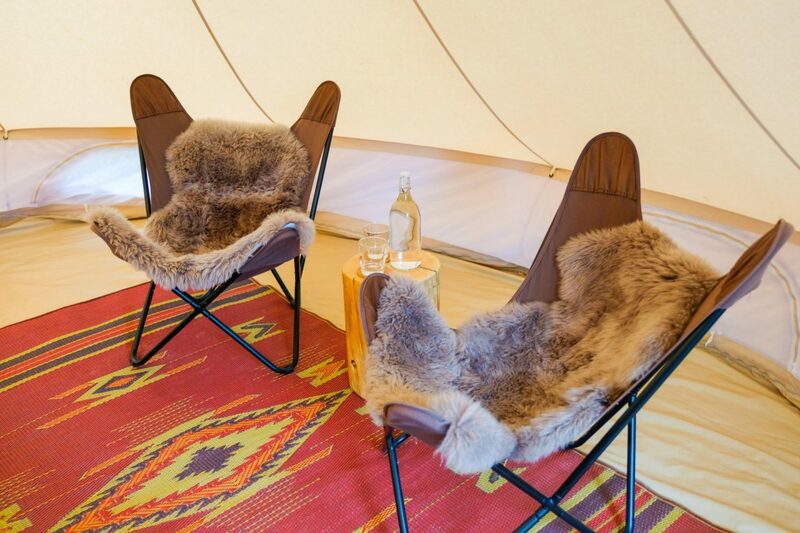 You should take a look at Glamping Hub. I was looking at some in Cali and they’re all so darn cute! Oh my goodness – this looks like the cutest little place to glamp ever!! I have always wanted to try it 🙂 Love your photos too by the way. Love love love love glamping! We glamped multiple times in Europe and absolutely fell in love. 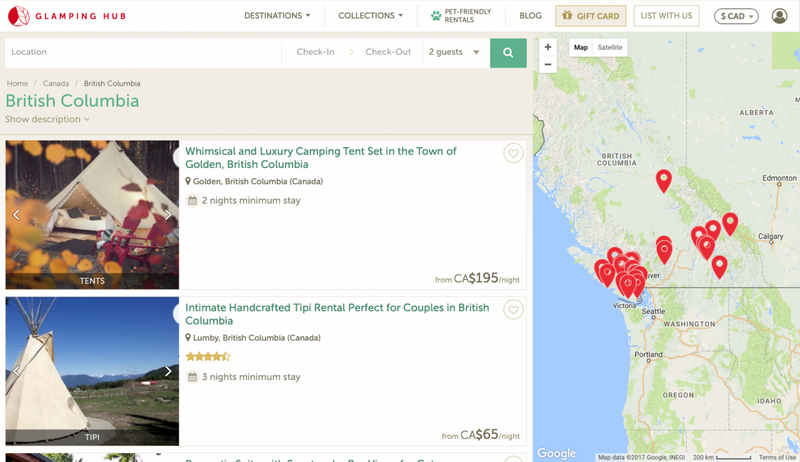 We have noticed that the pricing of glamping sites is much higher here in the PNW than we are used to. Still looks lovely regardless! Really!? That’s surprising. I’d think accommodation in Europe would be more expensive! And how lucky you are to have glamped so many times. I’d definitely love to try this again in Europe next time!! Ohhh my gosh this looks so magical!! I actually stayed in Golden a few weeks ago when I was in the Rockies (but at a crappy chain hotel hahah). This looks so much nicer. I’m having my first glamping experience in a few weeks so I’m so excited. beautiful pics! Always love your photos. Glamping is so up my alley. I never knew about Glamping Hub so thanks!! Man! This looks like too much fun! Glamping is definatly on my to-do list. Great photos! 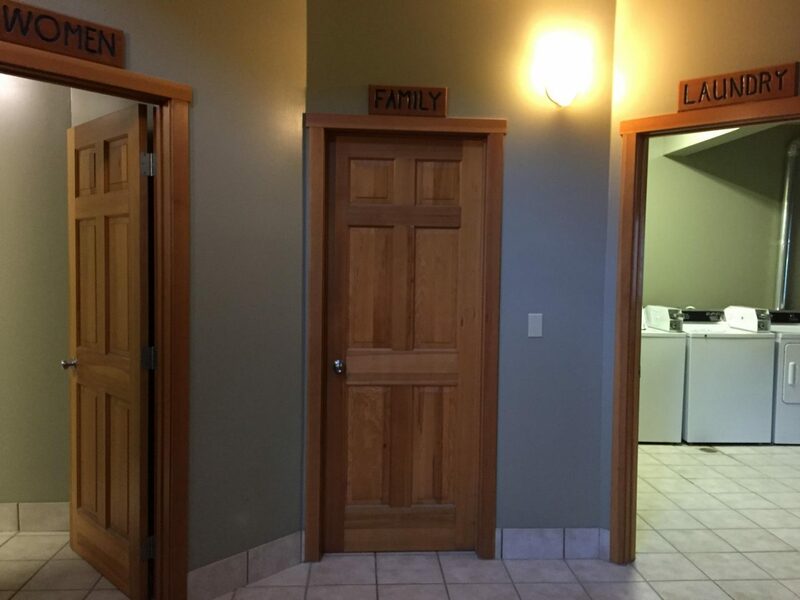 Wow this is such a unique accommodation! I would totally love to try out glamping! I love the idea of it for sure and they definitely decorated the place to cute! Ill have to check out glamping hub sometime! Gorgeous photos Jas! I’ve never heard of Glamping Hub – good idea for those who want that type of accommodation. I appreciate your pros and cons list. I have to admit that I usually choose a hotel over a glamping site due to the shared bathrooms. But you can’t beat the opportunity to stay ‘in the woods’ in style! I so want to do this! I I need to check out this location – the one I have seen are sooooo expensive! Absolutely loved your post and photos! Sounds like a lot of fun! Also, the in depth assessment with pros and cons is very helpful! 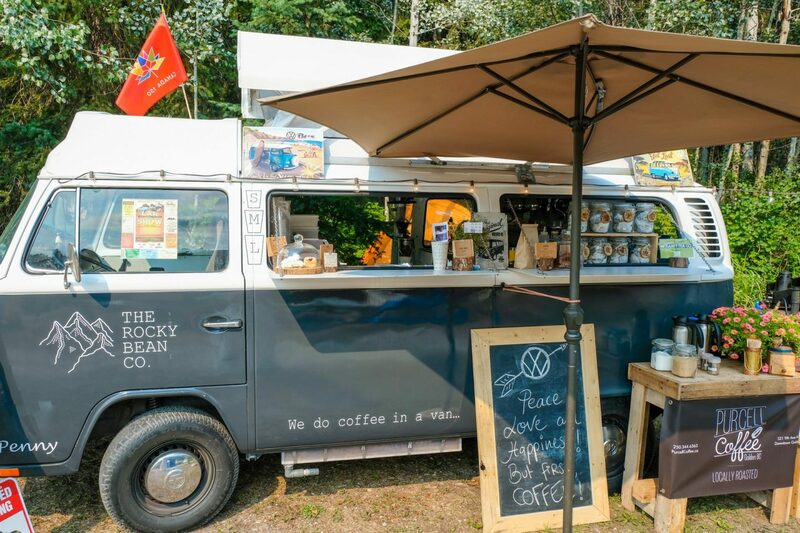 I’m checking out Glamping Hub right away! Glad you enjoyed it, Meghna! Hope you’ll get to experience glamping soon in the near future because I highly recommend it!! Sounds like such a fun experience! (Minus being kept awake until 2am.) Ha! I’ll have to check Glamping Hub out. I’ve heard good things! You def should, Dawne! Highly recommended! Omg what a beautiful glamping experience! I need to get on this site ASAP and see what’s around me. Hopefully there are options here in California! Oh there are tons! I saw a bunch on Glamping Hub and they’re all so sooooo cute! Looks like a very civilised way to camp without the worry of packing up all the gear necessary to camp. It looks very comfortable and the food also delicious. I think I could definitely handle this! Hahaha yes, this is definitely not your usual camping. Very comfortable indeed and super luxurious. You should give it a try!! I absolutely LOVE glamping and wish there were more options for it in my part of the world. Your pics make this experience look sooooo chic! I can’t wait for my next glamping adventure! Love this! 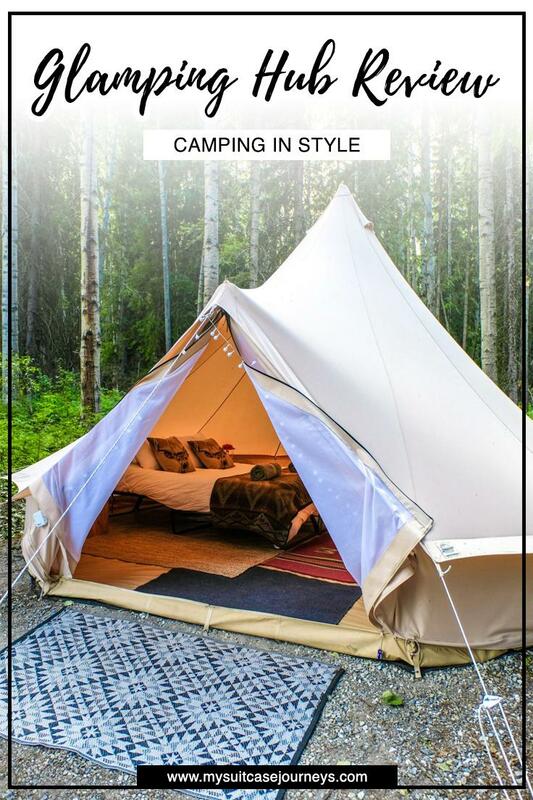 I really want to camp- but glamping sounds more my style! Now if only I could find a Sherpa for an AT trek lol! Glamping > camping for sure and I highly recommend it! Glamping is so much more my speed than regular camping! Everything looks so posh and comfortable. I love that this place is located in Golden. Such a fitting name! I’ve been obsessing over glamping forever now!!! But I can’t find a good spot in the east coast. I’m saving this for when I go out west! What a fine-looking tent! 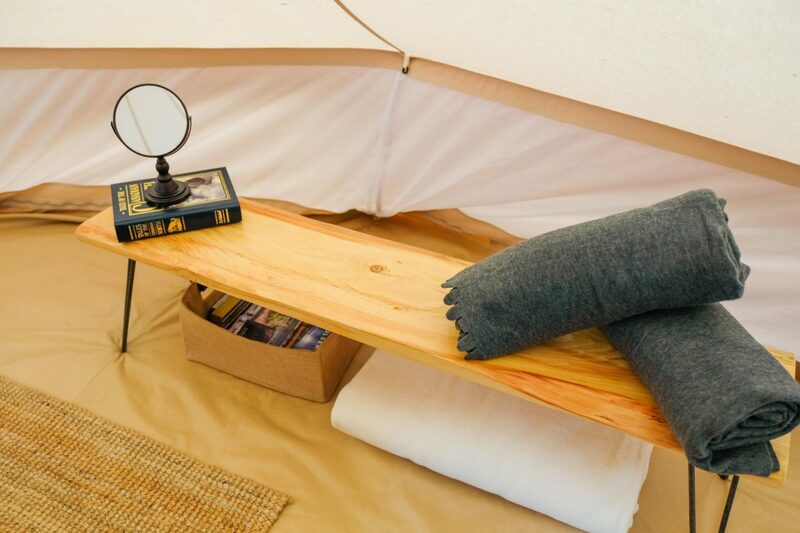 Great concept — the adventures of camping combined with the comforts of a hotel room. It’s a concept that is also gaining popularity here in the Philippines. Worth a try! Beautiful photos, by the way. Really!? In the Philippines!?!! Wow!!! I’d for sure love to go glamping in some of Philippines’ beautiful spots! Wow! I’ve read about glamping but none of them moves me to want to try. Your post is my ideal glamping experience. Prolly, I should save my anxiety till when I travel to Canada. I’d love to glamp with Love&Lantern too. Oh my, how beautiful is this experience. Certainly a step up from the camping I’m used to. 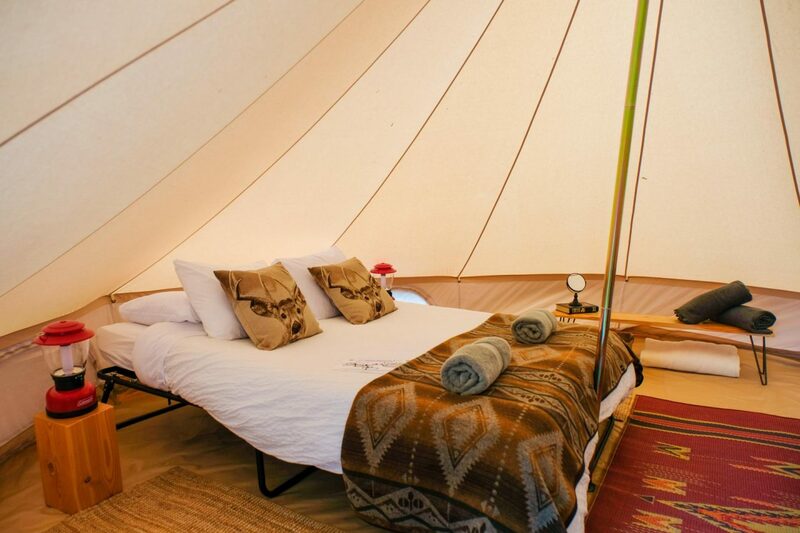 I did do glamping once at a festival but still not as luxurious as this… definitely looking in to this! Glamping at a festival!? How fun!! I’ve still yet to camp/glamp at one myself!! Wow, this is so cute! I’ve never tried glamping but I’ll have to look into it! It would probably be great for a more remote place where hotels would be further away from the action. 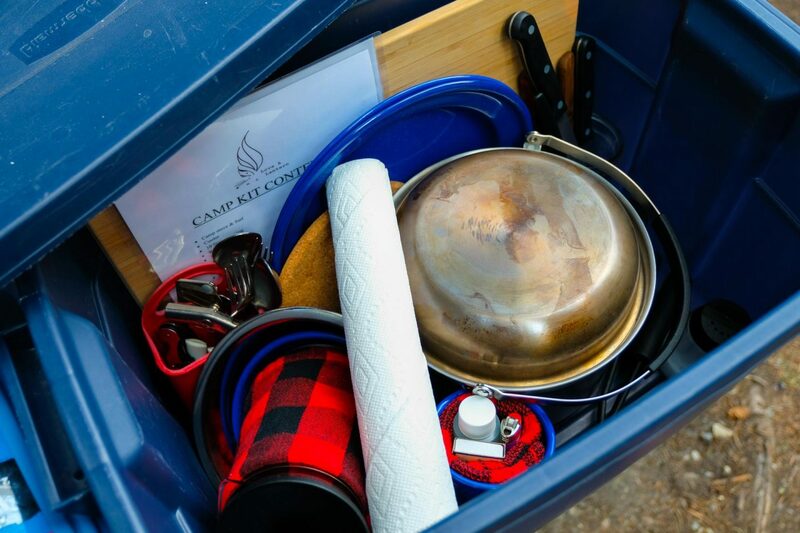 It would be great not to have to lug all your stuff around too! Oh for sure! So easy and effortless. I highly recommend you give it a try! It looks like such a cool experience! I went glamping in a shephard’s hut in Cornwall years ago and have really wanted to go again, but I feel like the prices have been getting out of control, especially in North America. I’m super keen to check out Firelight Camps in the Finger Lakes, though. Have you heard of it? No I haven’t but now I wanna check it out!!! 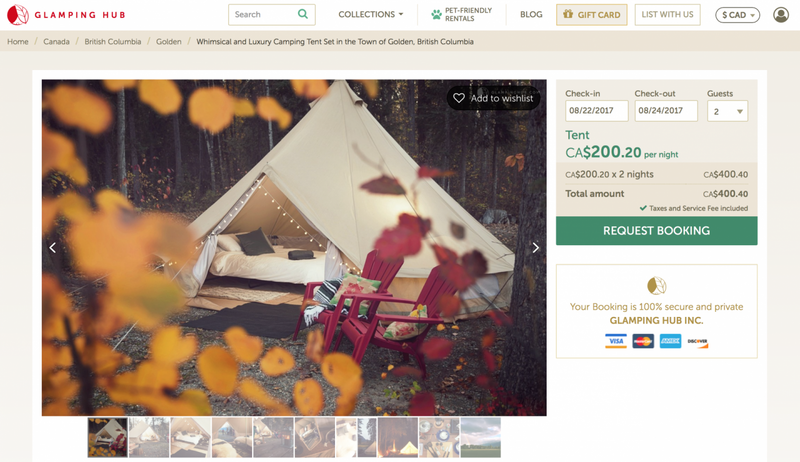 I’ve always known about glamping but never really did the research on staying at one so I had no idea prices were expensive here in North America! I guess that’s just what happens when things start to get trending. I have wanted to try glamping so bad! But like you said, sometimes it can be so expensive that it’s more cost-effective to stay at a normal hotel. I love the attention to detail in this tent and that you had a lot to do in the surrounding area. Now this is my kind of camping! I can’t imagine sleeping on the floor with a sleeping bag, but can totally get behind this. 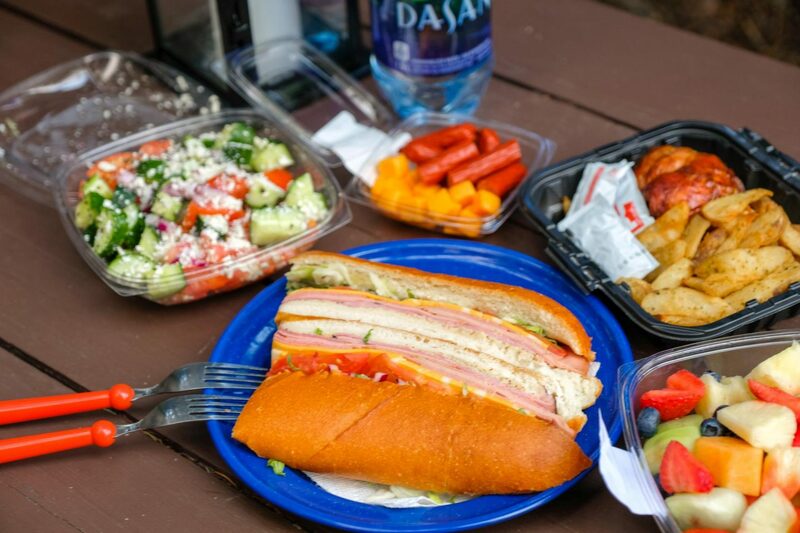 And your food looks awesome, not the typical camp food. Glamping has been on my travel to do list for absolutely ages. It looks so civilised and “old-worldy”. It makes me think that it’s camping from the Victorian era. Your glamping looks so gorgeous! Omg you’re so right!! I didn’t even think about that until you said it hahahaaa. While I am a fan of roughing it while camping this looks like a great way of introducing less keen friends to the idea of camping! 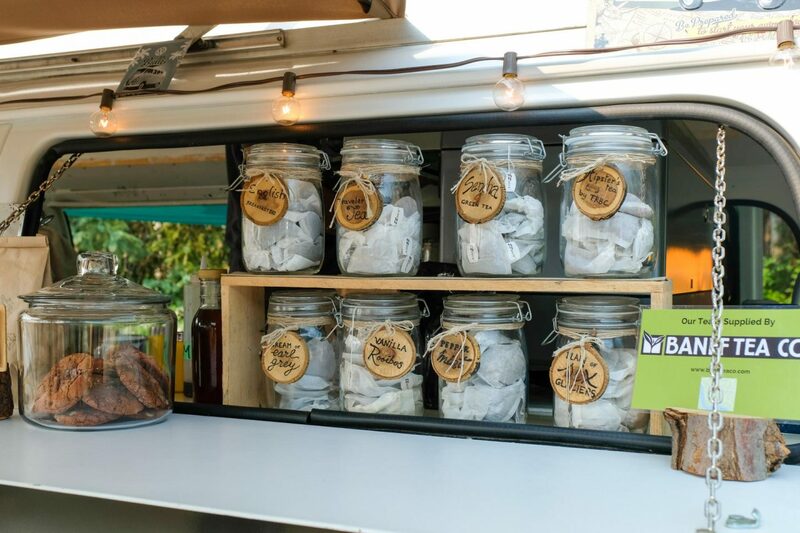 I will definitely keep Glamping Hub bookmarked for when that occasion arises! It totally is! But honestly, once you glamp, you can never go back to regular camping! I live in Banff and I had no idea you could go glancing in Golden! This looks amazing, I am adding this to my bucket list. P.s. golden is so underrated! I’m jealous!!! Banff is such a gorgeous place and Golden (even though it’s located in BC) is really quite close to you! You should definitely hit up the town more often if you can because you’re right, it’s too underrated! Love your pictures! I’ve heard of glamping but never been. 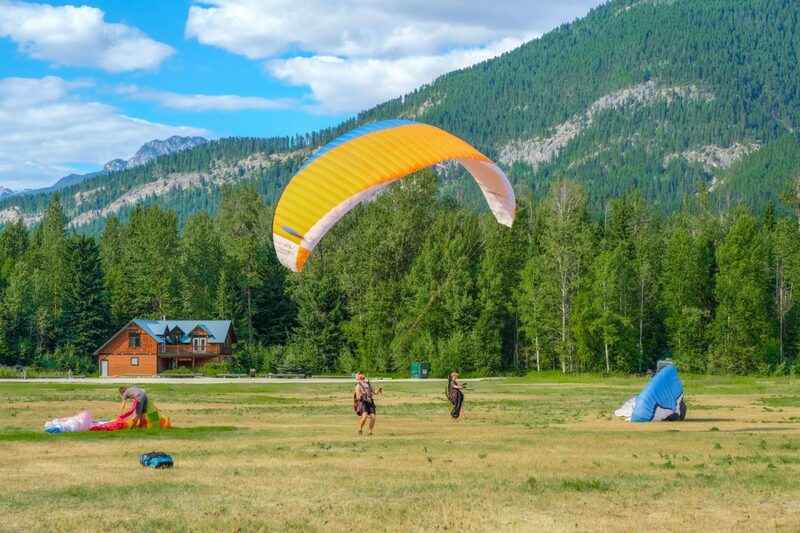 It looks a world away from regular camping – showers, laundry, a regular bed?! wow. pity that you couldn’t cook – that might have been fun. You’re right, for $195/night I could stay in a pretty decent hotel. But not out in the wilderness like that, so I guess it’s for people who want to escape the city and don’t mind paying hotel prices! We have never tried Glamping. 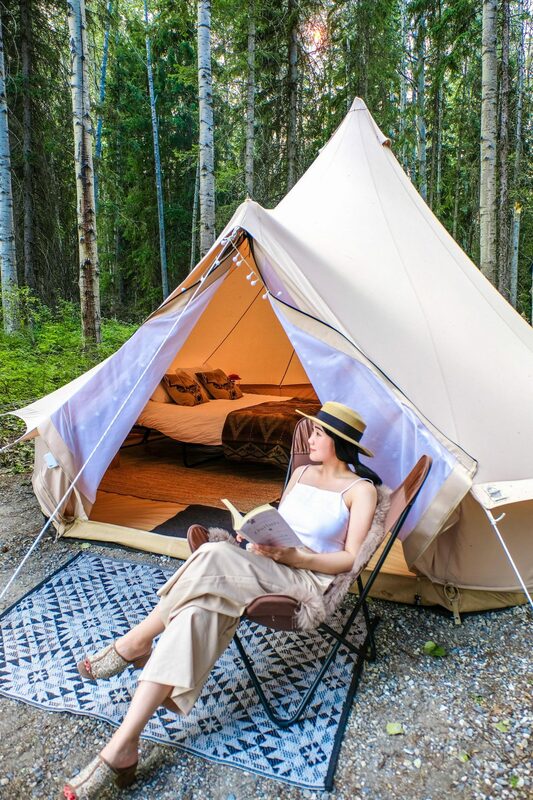 But reading your post and looking at the cute pics has definitely left us enamoured with this new way of camping. The place is really wonderful and the amenities provided are so convenient and comfortable. 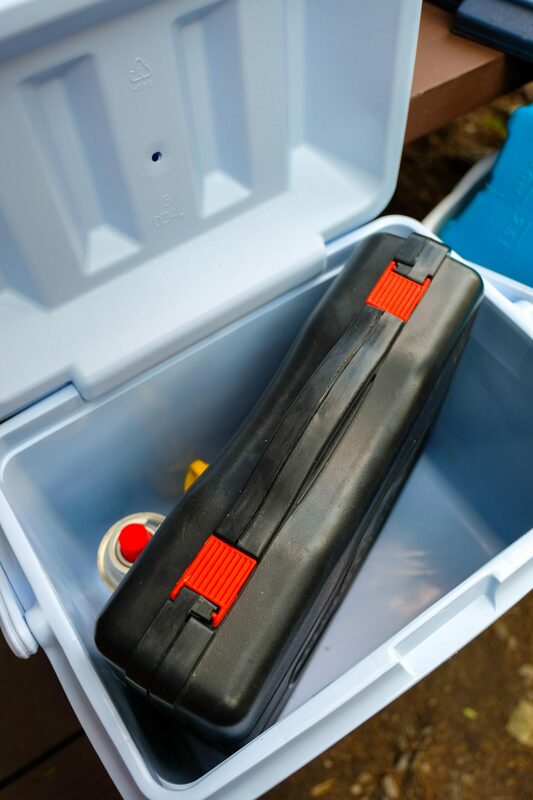 So you can enjoy the experience of waking up in the wild but still have the luxury and convenience of a home or a regular hotel. 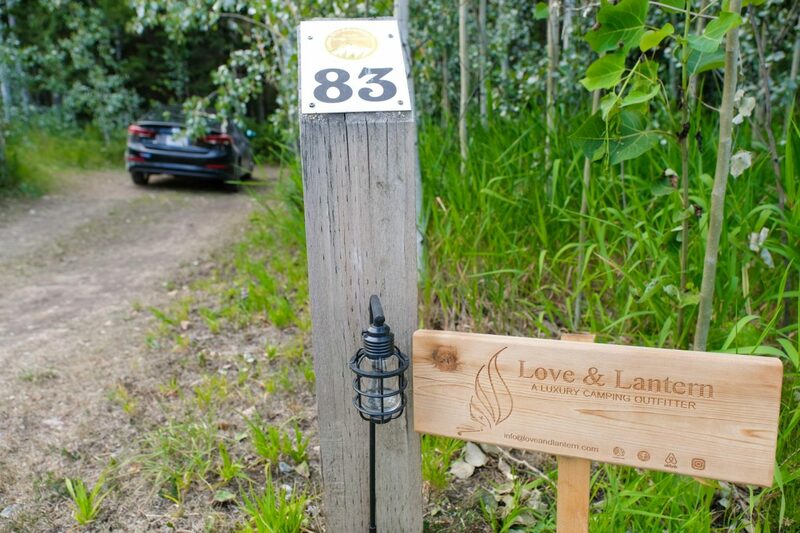 It’s really a luxurious upgrade to regular camping and I definitely recommend it if you’re a big nature lover and would like to try something different! It was really such an unforgettable trip. I highly recommend it!! Quick questions; are the visitors scanned by legal authorities? What is the consumer behavior? Do the guests interact with each other informally and make friends just like as in Starbucks? I have only tried glamping the once and it was a great experience. Certainly better than setting up the tent yourseelf. The scenery around the ranch is stunning too, great photos. Oh for sure! No hassle or anything! This was my first time but I think I’m definitely hooked. And than you so much for the kind words, Anthony. Hope you’re off to an amazing upcoming week! Aww I’m so happy to hear that I inspired you to try out glamping! It’s definitely an experience like none other and I really hope you’ll get to experience it soon someday!!! As a flashpacker, I’m definitely a glamper at heart, so loved this review. I love the scenery and can imagine how great it is to be surrounded by such stunning nature. I agree that at that price, you could stay at a decent hotel and not get bitten. However, as camping goes, this is very much somewhere I’d like to stay.